An amateur treasure hunter unearthed two Iron Age bronze bowls and a wine strainer just months after taking up metal detecting, an inquest has heard. The rare artefacts, of "great importance for the UK," were found in Newport, south Wales, in December 2007. It is believed the objects dating from around AD 25 were a religious offering. The Gwent Coroner declared them treasure trove. Security guard Craig Mills, who found the bowls, said he did not "have a clue" how old they were". The 35-year-old came across the items in the Langstone area of the city, only nine months after he took up metal detecting. Mr Mills said: "I didn't realise how significant it was. This discovery is of great importance for Wales and the UK. "I was detecting for nine months before that and I have found nothing like it." It is believed the objects were used for eating or drinking and were deliberately buried intact as a religious offering. They are believed to have been made around 25-60 AD and were buried at the time of the Roman army's campaign against the Iron Age Silures tribe of south Wales, between 47 and 75 AD. The two near-complete bowls have rounded bases, carefully formed rims and decorated fittings with rings for hanging them up and the strainer has a rounded bowl-shaped body with a wide, flat rim and a similar suspension ring. 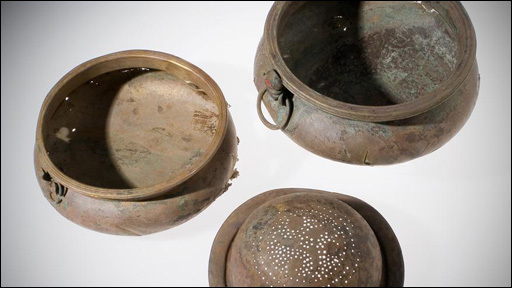 The decoration on all the vessels is of the late Celtic or La Tene style of the late Iron Age. Adam Gwilt, curator of the Iron Age Collections at the National Museum of Wales in Cardiff, said: "This discovery is of great importance for Wales and the UK. "Similar bowls have been found in western and southern Britain, but few find-spots have been carefully and recently investigated by archaeologists. "It seems these valued and whole containers were carefully buried at the edge of an ancient bog or lake, as part of a ritual offering. "We are looking forward to researching and investigating further during 2009, in order to reveal the full story of how these impressive decorated pieces were made, used and buried." The items were declared treasure by Gwent coroner David Bowen under the Treasure Act of 1996. It is hoped they will be displayed at the Cardiff museum in 2010.